This elegant wooden quadrant has hour lines traced on its face. It is calibrated for the latitude of Pisa. A lunar volvelle present with the sundial, indicates the phases of the moon. On the back are the shadow square, the unequal hours and the degrees of altitude, which are important for the use of the instrument in surveying and the calculation of heights and distances. 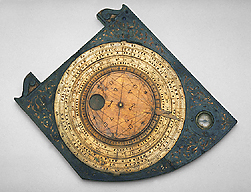 The instrument is provided with a compass and was made by Stefano Buonsignori, an Olivetan friar, and cosmographer to the court of Francesco I de' Medici.